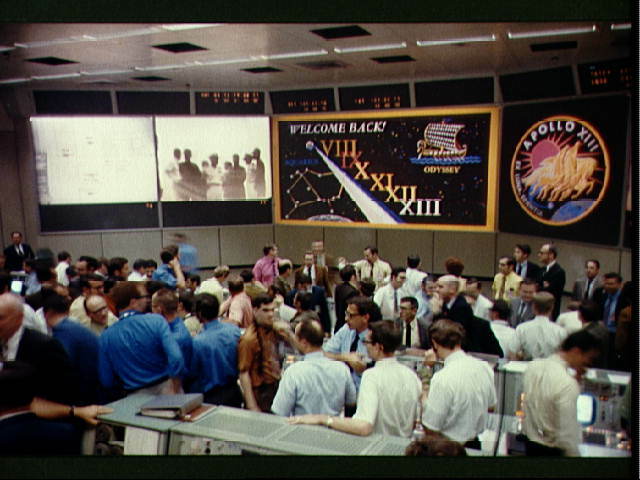 Overall view of Mission Operations Control Room in Mission Control Center at the Manned Spacecraft Center (MSC) during the ceremonies aboard the U.S.S. Iwo Jima, prime recovery ship for the Apollo 13 mission. The Apollo 13 spacecraft, with Astronauts James Lovell, John Swigert, and Fred Haise aboard splashed down in the South Pacific at 12:07:44 p.m., April 17, 1970.